With the growing popularity of IoT and smart devices, the first thing that comes to mind when talking about IoT is smart homes . This includes a whole bunch of devices including smart refrigerators, smart bulbs, power adapters, kettles, toasters, egg trays and what not. In this post, we are going to discuss about how to take over a BLE based IoT smart bulb, interact with it, change colors, and in the process also look into security internals of BLE. In case you are interested in a real-world version of the training class for your organization covering topics such as BLE sniffing, exploitation, Zigbee and more, feel free to contact us at secure@attify.com or have a look at Offensive IoT Exploitation . Connect the bulb to the power connection. Make sure it’s working by turning it on and off using your smartphone. The first step now is to find the bluetooth address of the target device. Step1: We will use hcitool to find all the available BLE device present near the host. In the above image, we will find the bluetooth address of the multiple devices around us. Upon inspection, it looks like 88:C2:55:CA:E9:4A is our Bulb and the Bluetooth name of the device is cnligh . Step 2: Now once we know the BD_ADDR (bluetooth address) of the target device, we can use gatttool to view the services running inside the target device. 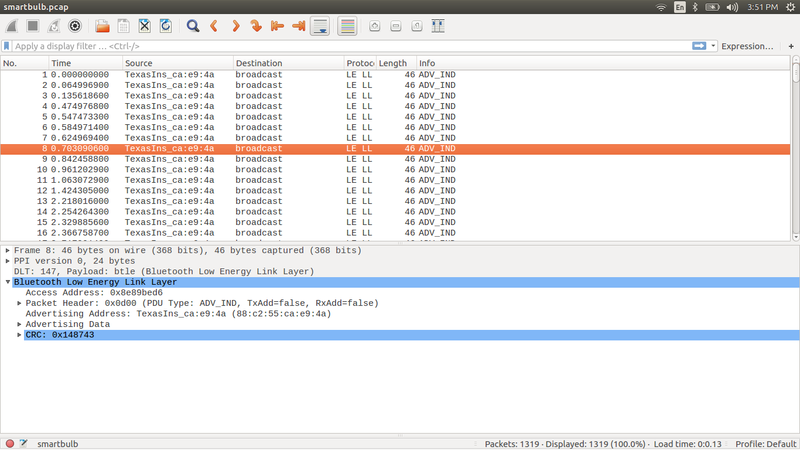 Use gatttool -I to switch to an interactive mode and connect to the target device using the particular BD_ADDR. In the above image, there are three primary service running among the three UUIDs. 00001800 and 00001801 is Bluetooth SIG defined service and the UUID 0000f371 is not one of the service defined by Bluetooth SIG. If we look at the above image, we can see the complete list of handles, for the particular UUID 0xffff. If we look it up, we will see that the service 0xfff1 to 0xfff9 is defined by the manufactures, other are services adopted by Bluetooth Special Interest group such as primary service, characteristic, characteristic user description. To know the Service and their paticular UUID value, refer https://www.bluetooth.com/specifications/gatt/services . When we try to read the handle we get an error message as shown in the above image. It’s a little complicated here because we don’t know that, to which handle we can should read/write data and we don’t even know the packet format. 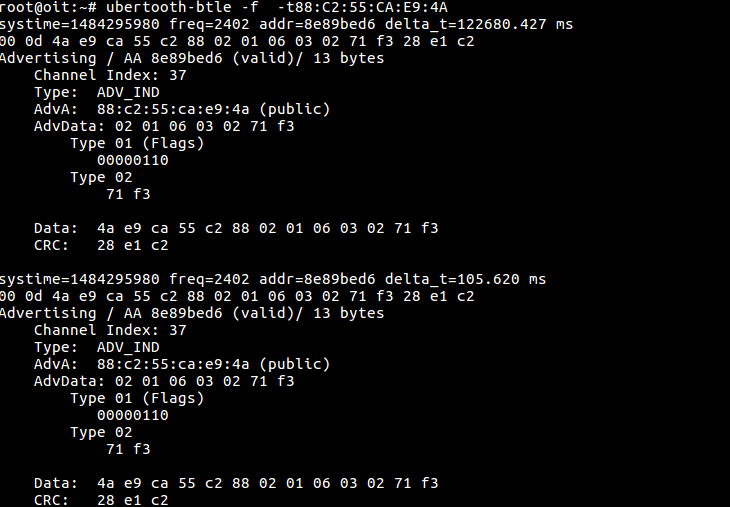 -c is used here to capture the packets in a pcap specified by the file name. In case you would like to perform an active traffic interception of the BLE device, you can also create a pipe by doing a mkfifo /tmp/pipe and then using it in Wireshark as the capture interface. Now open your mobile app for the bulb and connect it. 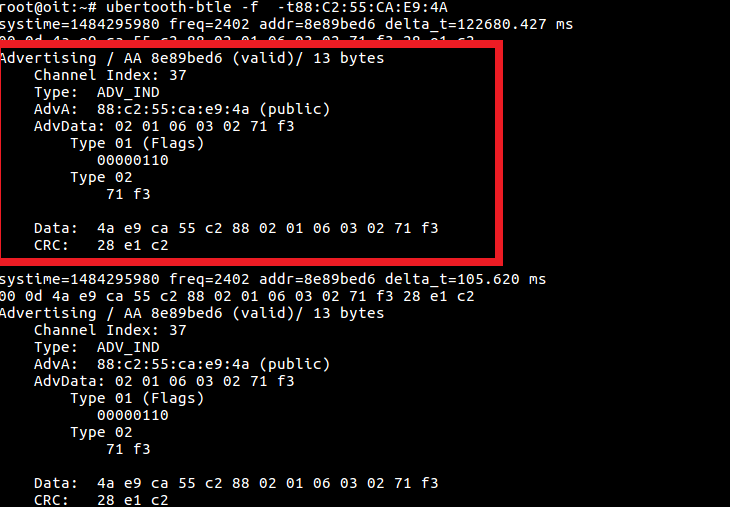 Once connected, perform an action such as changing the color of the bulb and ubertooth will capture all the packets. The Access address (AA) is 0x8e89bed6 , This is used to manage the link layer. Packet PDU is ADV_IND , meaning it is connectable, uni-directional and scannable. 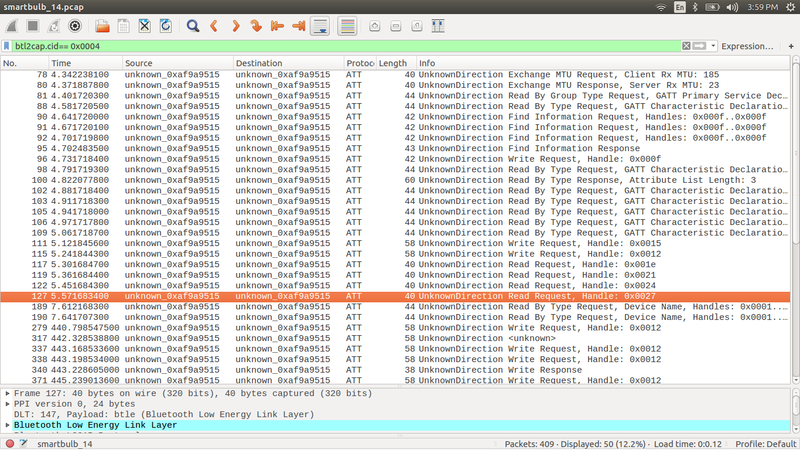 Step 7: Let’s analyze the captured packets using wireshark, open wireshark and open the captured pcap file. If you see here it will show all the captured packets. if we look into the above image there is only ATT packets and the info about the packet. Step 9: Here we have captured packets while changing the color of the bulb, so let’s look for the write request packets. Now we get to know that the data is written to handle 0x0012, which belong to a certain UUID which we need to figure out. It was found using a simple method that the RGB Values of 0 will turn the bulb off, thus the value 03c90006000a030101010000000000000000 and any value of RGB would turn the bulb on, such as a value of 03c90006000a0300010100ff0000000000000. This was also validated using the sniffed pcap.